The Military Air Transport Service (MATS) is an inactive Department of Defense Unified Command. Activated on 1 June 1948, MATS was a consolidation of the United States Navy's Naval Air Transport Service (NATS) and the United States Air Force's Air Transport Command (ATC) into a single joint command. It was inactivated and discontinued on 8 January 1966 when the Air Force and Military Airlift Command (MAC) as a separate strategic airlift command and returned shore-based Navy cargo aircraft to Navy control as operational support airlift (OSA) aircraft. 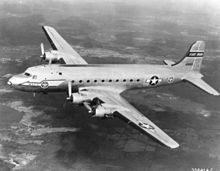 In 1966, the World War II Air Transport Command (ATC) (1942-1948) and the Military Air Transport Service were consolidated with Military Airlift Command (MAC) (1966-1992). The Military Air Transport Service (MATS) was activated under United States Air Force Major General Laurence S. Kuter, in order to harness interservice efforts more efficiently. It was an amalgamation of Navy and Army air transport commands, jointly placed by the Department of Defense under the control of the newly created United States Air Force (USAF) as a unified command. During World War II, the Army Air Force's aerial transportation requirements were performed by the Air Transport Command which had a dual function of ferrying new aircraft from factories to combat theaters and transportation of troops and supplies, also organized by Tunner. The Naval Air Transport Service focused on supporting deployed Naval and Marine personnel transporting vital cargo, specialist personnel and mail to the Fleet and ground forces, especially in advanced areas of operation. MATS was the first Joint-Service command and Naval aircrews participated in every major MATS airlift operation. MATS would organizationally be under the Department of the Air Force, as the vast majority of its equipment and personnel of ATC had been inherited by the Air Force with the inactivation of the USAAF. During the Berlin Airlift, Naval aviators flew transport aircraft from the United States to European supply depots; in the Korean War, MATS Navy Squadrons airlifted some 17,000 battle casualties. In its original organization, a Rear Admiral commanded the MATS Pacific Division and another rear admiral served as MATS vice-commander. During the 1958 reorganization, senior Naval officers were on the staffs of the commanders of both EASTAF and WESTAF, and at MATS Headquarters. In 1965 conflicting views of the Air Force and Navy triggered by the demands of the Vietnam War led to the services returning to separate airlift commands. In turn, MATS was disbanded and superseded in the Air Force by the Military Airlift Command, during a 1966 restructuring. With the end of World War II, the United States Army Air Forces Air Transport Command found itself in limbo. Senior USAAF authorities considered ATC to be a wartime necessity that was no longer needed, and expected its civilian personnel, including former airline pilots, to return to their peacetime occupations. Senior ATC officers, on the other hand, thought that ATC should be developed into a national government operated airline, an idea that was soundly opposed by the airline industry. While the war had firmly established the necessity of a troop carrier mission, most military officers believed the role performed by ATC should be provided by contract carriers. When the United States Air Force was established as a separate service in 1947, the Air Transport Command was not established as one of its major commands. The ATC commander and his staff took it upon themselves to convince the new civilian leadership of the newly created Department of Defense (DOD) (and Secretaries of the Army and Air Force) that ATC had a mission. They seized upon testimony by former I Troop Carrier Command commander Major General Paul L. Williams that the Air Force should have a long-range troop deployment capability, and began advocating that ATC transports could be used to deploy troops. Williams had been pressing for the development of a long-range troop carrier airplane when he made his statement. 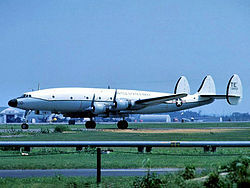 A U.S. Navy Douglas R6D-1 Liftmaster, BuNo 128425, operating for the Military Air Transport Service in the 1950s. The DOD believed it should have its own air transport service and decided that ATC should become the Military Air Transport Service (MATS), supported by the Air Force, even though not listed as a formal military mission. Also, as a cost-saving measure, MATS would combine the resources of Air Transport Command with those of the Naval Air Transport Service. This way the command would be sanctioned by the Department of Defense, and not by either the Air Force or the Navy. Although MATS was under the operational control of the United States Air Force, the United States Navy was a full partner in the command and operational components of the organization. Major naval components of MATS were naval air transport (VR) squadrons. VR-3  and VR-6  were assigned to McGuire AFB and VR-22 was assigned to the Naval Air Transport Station at Naval Station Norfolk/Chambers Field, Virginia. Together they constituted MATS EASTAF's Naval Air Transport Wing, Atlantic. On the Pacific Coast, Naval Air Transport Wing, Pacific, consisted of Air Transport Squadron VR-7 and Maintenance Squadron VR-8, both at Naval Air Station Moffett Field, California. A detachment of VR-7 was also stationed at Tachikawa Air Base, Japan. Naval aviators flew scheduled MATS routes to Newfoundland, Iceland, Scotland, West Germany, Italy, Puerto Rico and Africa. In the Pacific, MATS naval aviators flew to all MATS stations from Hawaii to Japan to South Vietnam, Bangkok, India and to Saudi Arabia. Air Force pilots flew Navy MATS planes, just as naval aviators could be found piloting Air Force MATS transport aircraft. MATS Lockheed C-141A-10-LM Starlifter, AF Ser. No. 63-8090, in 1965 just after delivery to the 1501st Air Transport Wing at Travis AFB. Retired on 7 August 1996, Scrapped 29 July 2003. Douglas C-133B-DL Cargomaster, AF Ser. No. 59-0529, of the 1501st Air Transport Wing over San Francisco Bay in 1960. This aircraft was retired in 1971 and was on display at New England Air Museum, Bradley, Connecticut (USA), but was destroyed by a tornado on 3 October 1979. Nose and other pieces now at the AMC Museum at Dover AFB, Delaware. Douglas C-54E-10-DO Skymaster, AF Ser. No. 44-9093. Converted to MC-54M in 1951. To civil registry as N4989K. Last known still in service by Contract Air Cargo, Fort Lauderdale, Florida flying in Africa. Pacific Division (after 1 July 1958: WESTAF) - From Travis AFB, California, provided service to Hawaii and on to locations in the Pacific, including Japan and the Philippines; across Southeast Asia; India; Pakistan and on to Dhahran, Saudi Arabia. Continental Division - From McGuire to points in Northern Canada; along the North Atlantic coast north to Thule AB, Greenland. From Travis north to McChord AFB, Washington, then north to Alaska and Aleutian Islands, then a connection into Tachikawa AB, Japan from Shemya AFS. Also provided coast to coast aeromedical evacuation flights within the United States and cargo service between major Air Force Air Materiel Command depots. The division was disbanded on 1 July 1958, with mission divided between Eastern Transport Air Force (EASTAF) and Western Transport Air Force (WESTAF). The Special Air Mission was the transport of the President of the United States; Vice-President; Cabinet Members; Member of Congress; Senators, and designated other individuals, such as Foreign Heads of State. Weather forecasting for military airfields; hurricane hunters. Mapping the world providing accurate aerial charts to military aviators wherever they need to be. Also producing all Air Force training films; public relations films; monthly newsreels, and coordinating with private filmmakers with regards to use of Air Force equipment and facilities. Evacuation of wounded military personnel from combat zones; transport of critically ill military personnel (and dependents) to military medical facilities for treatment. Performed unconventional warfare missions during the Korean War and early years of the Cold War (1950–1956). MATS was established on 1 June 1948, less than a month before the commencement of the Berlin Airlift -- "OPERATION VITTLES" where at peak operations, planes were landing and departing every ninety seconds or so shuttling in thousands of tons of supplies, food, and fuel each day - but they were not MATS airplanes. The Soviet Union had blocked all surface transportation in the western part of Berlin. Railroads tracks were destroyed, barges were stopped on the rivers, and highways and roads blocked. The only avenue left was through the air. On 26 June 1948, the airlift began. Troop carrier transports from around the globe began making their way to Germany, where they were assigned to United States Air Forces, Europe. Squadrons transferred from as far away as Hawaii and Japan, and included two of the U.S. Navy's air transport squadrons assigned to MATS. MATS itself was not "in charge" of the airlift, although several MATS staff officers were sent to Germany to serve in the Airlift Task Force in an administrative role. Lt. General William H. Tunner was placed in overall command of airlift operations, reporting to the commander of United States Air Forces, Europe. The airlift itself was a USAFE operation and all airplanes assigned to it were assigned to one of five troop carrier groups that were sent to Europe to operate the airlift. MATS played a supporting role, including ferrying C-54s to and from the airlift bases and maintenance depots in the United States and the MATS C-54 training school trained pilots for temporary duty in the airlift. MATS transports delivered crucial aircraft parts to the airlift bases in Europe. This operation would continue for some 15 months until the Soviets lifted the blockade. MATS would provide numerous humanitarian airlifts of global proportions. The U.S. Navy was an integral part of MATS, providing five transport squadrons to the joint service effort, but they operated under USAFE while they were part of the airlift. The organization's next major test was the bootstrap supply operations supporting the United Nations troops under General Douglas MacArthur in the country of South Korea which was nearly overrun by the time UN forces were mobilized. The MATS role was purely logistical, and operated from the United States to Japan. Theater transport forces assigned to the Far East Air Forces Combat Cargo Command, which became the 315th Air Division, operated supply routes into Japan and provided troop carrier services for UN forces. During the 1956 Suez Crisis, MATS MATS airlifted 1,300 Colombian and Indian troops from Bogotá and Agra to the United Nations staging area in Naples, Italy, to supplement the UN police force in the Suez area. In 1958, MATS airlifted 5,500 tons of cargo and 5,400 troops to the Middle East in support of the Lebanese government, also supporting the move of a TAC Composite Air Strike Force to the area. Also in 1958, MATS flew 144 airlift trips to the Far East when the crisis arose in the Formosa Straits, supporting the move of a Composite Air Strike Force, and airlifting a squadron of F-104 Starfighters to Taiwan. In December 1962, MATS Douglas C-124 Globemasters ended six years of seasonal flying as members of the Air Force-Navy team resupplying scientific stations in the Antarctic. During that time the aircraft, operated by the 63d Troop Carrier Wing stationed at Donaldson Air Force Base, South Carolina, air-dropped about 4,000 tons of supplies from the main Antarctic base at McMurdo Sound to remote stations near and at the South Pole. Beginning in 1963, Lockheed C-130E Hercules, newer, faster, and longer range, picked up the MATS portion of the mission. The performance of the C-124s in the Antarctic cold strengthened the concept of airlift flexibility by doing in a few weeks (each year) a job that would have taken surface transportation several months. During Deep Freeze III, a C-124 air-dropped a seven-ton tractor to an isolated site, and during Deep Freeze 62 (October–December 1961), three C-124's made the longest flight in Antarctic history, a 3,100-mile round trip to airdrop supplies. Also during Deep Freeze 62, Lt. Gen. Joe W. Kelly became the first MATS commander to visit the operation. MATS vice commander, Maj. Gen. Raymond J. Reeves, visited Deep Freeze 63. MATS C-124 Globemasters and C-118 Liftmasters (and in November 1962, pure-jet C-135 Stratolifters) by the end of November had chalked up more than 2,000 missions in history's longest airlift reaching 5,000 miles from Europe around Africa's West Coast to Leopoldville in the Congo. MATS entered the United Nations airlift under direction of the United States Air Forces in Europe (USAFE) 322d Air Division, 16 July 1960, and at the peak had 60 aircraft committed. By the end of 1962, about 49,000 troops and 11,000 tons of cargo had been airlifted to and from points as far away as New Delhi, India. As a result of the construction of the Berlin Wall and the ending of free crossing to and from their occupation zone of Berlin, more than 100 MATS =aircraft from EASTAF and WESTAF participated in deployments of American forces from the United States to West Germany and France. When the Reserve Forces were called to active duty in October 1961, MATS airlift force and technical units provided support for their movement to Europe. Operation Stair Step was the name given to the deployment of Air National Guard fighter units overseas to NATO bases in France, and Operation High Top was the redeployment, June–August 1962. In High Top, for example, more than 260 missions were flown by MATS aircraft of all types, including the C-97's which themselves had been called to active duty. These aircraft returned more than 9,600 ANG personnel and 1,400 tons of equipment. On addition, the 101st Airborne Division was airlifted from Fort Campbell, Kentucky to locations in Turkey. Approximately 2,000 personnel and 900 tons of equipment were airlifted (Exercise Checkmate II). During the exercise, about 300 MATS airmen and officers lived in tents for about three weeks handling maintenance and communications. Lt. Gen. Joe W. Kelly, MATS commander, was on hand to greet the first arriving aircraft, Despite "miserable" weather, no accidents or incidents occurred. Throughout 1962, tensions were high in Europe and in January, Exercise Long Thrust II was commenced in which MATS new four-engined jets, the Boeing C-135 Stratolifter, made their first appearance in a major airlift when 12 of them airlifted nearly 500 Army troops over the north polar route from Fort Lewis, Washington, to central West Germany. They made the nonstop trip in little more than 10 hours compared to the piston-engined aircraft which averaged between 30 and 35 hours along normal routes. Altogether, more than 200 MATS aircraft moved 5,300 troops of three battle groups of the Army's 4th Infantry Division in the deployment phase. The jets brought one battle group back. In West Germany, the troops participated in ground maneuvers with NATO forces. In the midst of one of the heaviest airlift schedules it has ever had (more than 17 airlifts under way or developing during October and November), MATS was called on to support the buildup of forces in the southeastern part of the United States. On 16 October, MATS began working at its wartime activity rate. Between 16 October and the end of the month, MATS airlifted thousands of troops and thousands of tons in hundreds of sorties from bases throughout the country into Florida and Guantanamo Bay, Cuba. Included in this was the first major airlift of United States Marines and their combat gear by MATS. Also, during this buildup, MATS lost its first C-135 Stratolifter jet while it was engaged in an ammunition airlift to Guantanamo Bay. All three of the technical services stepped up activities to provide close weather, rescue, and documentation support to the buildup. During the airlift operation, MATS was called on to react to a call for arms to India in early November to stem the Communist Chinese invasion. The airlift required the movement of 980 tons of small arms more than 6,000 miles from Rhein-Main AB, West Germany, to Dum-Dum Airport, Calcutta. This "no notice" airlift was accomplished in eight days by MATS C-135 Stratolifter jets. Beginning in 1948, MATS flew airlift missions into French Indochina, providing airlifts of military equipment and supplies to the French government and colonial Vietnamese forces fighting the Viet Minh. In 1954, at the request of the French, wounded Legionnaires from Dien Bien Phu were transported from Tan Son Nhut Airport to either Algeria or France. Initially flown from Saigon to Tachikawa AB near Tokyo on C-124s, over 14,000 wounded soldiers received stabilization medical care. From Japan, the wounded were airlifted across the Pacific Ocean to the Western United States on MATS C-97s. At each of the subsequent stops at Hickam AFB, Hawaii; Travis AFB, California, and Westover AFB, Massachusetts, there were layovers of about a day. This portion of the journey was carried out by MATS' Pacific Division. From Westover, the Atlantic Division took charge and airlifted the wounded to Orly Air Base in France and Oran Airport in Algeria. From start to finish, the mission took about a month to complete. Throughout the 1950s and early 1960s military aid was shipped to the South Vietnamese government by MATS airlift flights into Tan Son Nhut. In addition, military flights were made to Don Muang Airport in Bangkok which were designated for the Thai Militarily to protect their border along the Mekong River, or clandestinely to the Laotian Government, who were fighting communist rebels in Laos. As the United States built up its forces in Southeast Asia in the early 1960s, the number of MATS flights to the area increased. MATS C-124s and C-133 Cargomasters were common sights. After the 1964 Gulf of Tonkin Incident, and the decision being made to escalate United States involvement in the Vietnam War, MATS performed a critical role in the air transport of personnel and equipment to the war zone. Throughout 1964 and 1965 MATS flew large numbers of United States Army and United States Marines to South Vietnam. Large MATS aerial ports were established at Da Nang, Cam Ranh Bay and Tan Son Nhut in South Vietnam, as well as at Don Muang Airport in Thailand to support the United States forces there. The first large-scale MATS jet transport flights of C-141A Starlifters were to Tan Son Nhut Air Base in 1965. During Vietnam, MATS was jokingly said to be an acronym for "Maybe Again, Tomorrow, Sometime." On 1 January 1966, as a result of the Navy announcing the withdrawal of its components, MATS was redesignated Military Airlift Command. The R5D Skymasters of Naval Transport Squadron Seven Alpha (VR-7A) were retired in July 1966 and the unit inactivated. VR-7, flying C-121/RV-7 Super Constellations remained attached to MAC until 31 January 1967, and the Naval Air Transport Wing (Pacific) was inactivated on 23 March 1967. VR-8 and VR-22 at NAS Moffett Field withdrew its C-130s from MAC on 20 April. 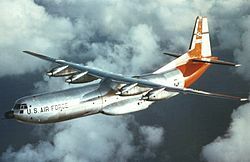 The last naval squadron, VR-3, flying C-130s from McGuire AFB, was inactivated on 30 June and the formal DOD program action directive relieving the Navy from MAC responsibilities became effective 1 July 1967. Most passenger transport missions except the Special Air Mission were contracted out by MAC to commercial airlines such as Pan American, TWA, United, Continental, Northwest and charter companies such as Flying Tiger, using the Civil Reserve Air Fleet (CRAF). This provided commercial airline pilots and aircrews valuable training, and during the years of the Vietnam War, seeing Boeing 707 and Douglas DC-8 commercial airliners at MAC aerial ports in Southeast Asia was a common sight. On 1 December 1974, MAC expanded its mission by acquiring the theater troop carrying and tactical airlift mission (i.e., C-130 Hercules, C-123 Provider, C-7 Caribou) previously performed by the combat commands (TAC, PACAF, USAFE). In 1987, MAC was designated as the Air Force component of the United States Transportation Command (USTRANSCOM), a unified joint-service command. In June 1992, MAC was reorganized and redesignated as the Air Mobility Command (AMC) with a broadened mission of aerial refueling (i.e., KC-135 Stratotanker and KC-10 Extender), acquired from the inactivating Strategic Air Command. AMC then succeeded MAC as the USAF component of USTRANSCOM. Mission and operational control of Air Transport Command, established on 29 May 1941, consolidated into organization same date. Air Transport command discontinued and inactivated same date. Mission and operational control of Naval Air Transport Service, established on 12 December 1941, consolidated into organization same date. Navy components assigned to: United States Navy. Note: 4-digit Military Air Transport Service units at all levels were considered Major Command (MAJCOM) provisional units by the USAF due to MATS being a Department of Defense Unified Command. Under the USAF lineage system they did not a permanent lineage or history and were discontinued upon inactivation. On 1 July 1957 a reorganization of USAF troop carrier forces included the transfer of Tactical Air Command Eighteenth Air Force heavy-lift C-124 Globemaster II units to MATS. However, the units retained their troop carrier designation and remained dedicated to support TAC on worldwide troop deployments. Upon its establishment, Military Air Transport Service inherited much of Air Transport Command's worldwide network of stations and transport routes. By the time of its disestablishment, MATS had closed its facilities at many of these stations; however, some are still in use today by Air Mobility Command in support of United States interests around the world. On 22 March 1955, a U.S. Navy Douglas R6D-1 Liftmaster, BuNo 131612, operating a MATS flight from Tokyo, Japan, to Travis Air Force Base, California, via Hickam Air Force Base, Territory of Hawaii, flew into a mountain peak in Hawaii, killing all 66 people – 55 military passengers, two civilian passengers, and a Navy crew of nine – on board. It remains both the deadliest aviation accident in the history of Hawaii and the worst heavier-than-air accident in the history of U.S. naval aviation. 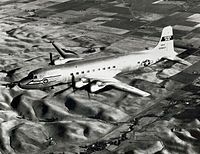 On 10 October 1956, a U.S. Navy Douglas R6D-1 Liftmaster, BuNo 131588, operating a MATS flight from RAF Lakenheath, England, to Lajes Field in the Azores disappeared over the Atlantic Ocean, killing all 59 people – 50 U.S. Air Force passengers from the 305th Bombardment Wing and a Navy crew of nine – on board. A search discovered wreckage from the aircraft floating in the Atlantic, but no survivors or bodies ever were found. ^ "VR-3". Navy MATS VRs. ^ "VR-6". Navy MATS VRs. Retrieved 2 December 2016. ^ Broughton, Jack, Thud Ridge. New York: Bantam Books, 1969. ^ Grossnick, Roy A., United States Naval Aviation 1910-1995, Washington, D.C.: Naval Historical Center, undated Archived 12 September 2012 at the Wayback Machine ISBN 0-945274-34-3, p. 206. ^ Grossnick, Roy A., United States Naval Aviation 1910-1995, Washington, D.C.: Naval Historical Center, undated Archived 12 September 2012 at the Wayback Machine ISBN 0-945274-34-3, p. 214, states that the accident date was 11 October 1956. Stanley M. Ulanoff, MATS: The Story of the Military Air Transport Service, 1964, The Moffa Press, Inc.